Lots of fun things going on with us. You may have noticed a real down tick in events being scheduled and newsletters going out. This is in part due to us wanting to improve the experience you are having at our events and us wanting to organize more events across the region. In order to accomplish those goals we are designing new sponsorship packages and redesigning our paid membership programs to help us bring in more capital and resources to improve your experience. Expect an announcement about those shortly. We have also been building a lot of new partnerships with great companies like RMS Printing to bring you more benefits. Be sure to reach out to them if you need any signage, business cards, or anything promotional. Seriously, they can do anything. I’m waiting on some 805 Startups branded hammocks. haha. Just let Saleem know Gary from 805 Startups sent you. One big goal for us is making our flagship Innovation and Growth Fair a much larger event each quarter. We accomplished that, thanks to many of you that joined us as speakers, exhibitors, and mentors last month. 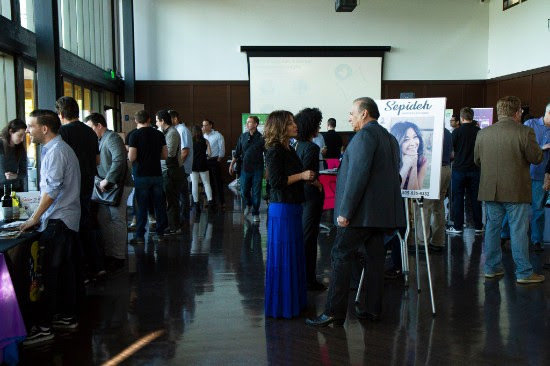 We had over 25 exhibitors and over 80 mentors on our expo floor. It was an incredibly impactful event that helped forge amazing new relationships within the community and provide invaluable guidance to about 400 attendees! We continue to bolster the event with new faces that are eager to support our Platinum Members and our entire community. It’s been a great experience for all as we get to enjoy some amazing food from wonderful hosts like Uncle Af’s and Public School 805 that are eager to support the community and each of you. Definitely reach out to them if you’re looking for amazing catering options, a location to host a meetup or fundraiser, or just have a rumbling in your stomach. Ben at Uncle Af’s is a new business owner and eager to make new friends in the community while feeding your face with some delicious sandwiches and sides. Public School is also looking to connect with all the non profits in the area as they are about to roll out a new program to assist in fundraising efforts. Just ask for Austin and let him know Gary from 805 Startups sent you his way. If you are feeling shy and want an intro to Austin, just shoot me an email! We will be organizing an online directory for attendees to browse before/during the lunch for more efficient networking. We will also be putting up a form for you to make introduction requests so we know who to extend invitations to from across the entire region. Be sure to sign up as a Platinum Member to gain access to the lunches and other benefits. We have now done this event three times now at the amazing new Pharos Center for Innovation that our great friends Erick and Bryan Went have recently opened. Each event has gone over the scheduled time with almost every single person staying until the very end. The event goes over due to us encouraging everyone to get up in front of the community to give a pitch. Most are elevator pitches for only a rough idea. Even that experience has beneficial results for the person pitching and for those of us giving feedback to them. It’s proven to be more than just practice for pitching by providing a great way to build relationships and practice valuable skills like empathy, awareness, and diplomacy. If you have an idea or something you are actively working on, whether it is your own business or something tied to a career, we want you to join us at the next one! We recently found ourselves in a position to acquire four other meetup groups. We have effectively boosted our membership from 2,450 members to 5,800 members. The exciting thing is that three of these additional meetup groups have a strong concentration of members across LA county where we already have strong partnerships with universities, coworking spaces, and government agencies. For the past 18 months we have been getting a lot of interest in organizing events a little more south and we feel like now it makes too much sense to not do it. So, for those of you outside of the 805 we will be bringing you some of our great events closer to you in the very near future. Expect to see North and South versions of our FEM and Pitch Your Peers events to roll out first. We are also hard at work on a blockchain series, a physical product series, and a special event designed only for accredited investors. Our founder, Alon, is now managing Wavemaker’s new Genesis Fund that is focused on crypto and blockchain companies. If you have a startup or know of one that might be interesting, be sure to come to an event and share it. In fact, sign up to exhibit at our June 27 Fair! Meanwhile, our president and director of experience, Gary, has been hard at work meeting with government agencies, nonprofits, architects, and real estate developers to move the Startmada initiative forward. The goal is to establish an Innovation Village in each partner city with a scouting program and an accelerator program to find and develop amazing talent and job providers that align with the city’s cultural identity. This is our way to help modernize and grow our local cities in a controlled manner that doesn’t sacrifice what makes them each unique and instead builds upon that culture. A lot more on that soon.